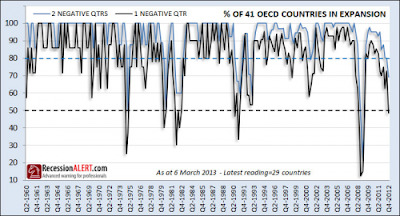 The following excellent graph from recession alert shows the percentage of the 41 largest OECD countries around the world that tipped into GDP contraction last quarter. The blue line tracking it down shows those that have been contracting for 2 straight quarters. In essence, the "world" has tipped back into recession seen last in 2008. There are some parts of the world where the the idea of an economic slowdown does not seem possible even though it is occurring around them every day. One of those places is the United States where stocks magically levitate every day in a new world where real fundamentals, earnings, or economic strength have no impact on share prices (until they do, and then God help those that have been sucked back into the artificial mirage). Lakshman Achuthan discussed this topic on Bloomberg this week where he was once again brought out to the mainstream media wolves where they try to attack a premise that "an economy cannot be slowing if a stock market bubble is expanding." Achuthan calmly and patiently counters with both facts and real economic data. He notes that in 1980, 1945, and 1926 stock prices rose through a recession that was in place. Most real world, non-bubble stock price indicators, show growth slowing.